1. Assign an action to every thing you come across. Whether you can deal with something that lands on your lap now or later, at the very least, know what you are going to do with situation, jot it down, and put it in an action folder. 2. Make daily lists of the six most important tasks you must accomplish each day. We are not going to get everything done, but again, at the very least, you can take care of those items that have the most significant priority and that will make the biggest impact. Sure you have 100 other things that must get done, but you can detach yourself from your office knowing that you have moved forward a significant bit at a time. 3. Plan how long each task will take. This will help you see which tasks will take up the most of your time and allow you to see the big picture of your day. 4. 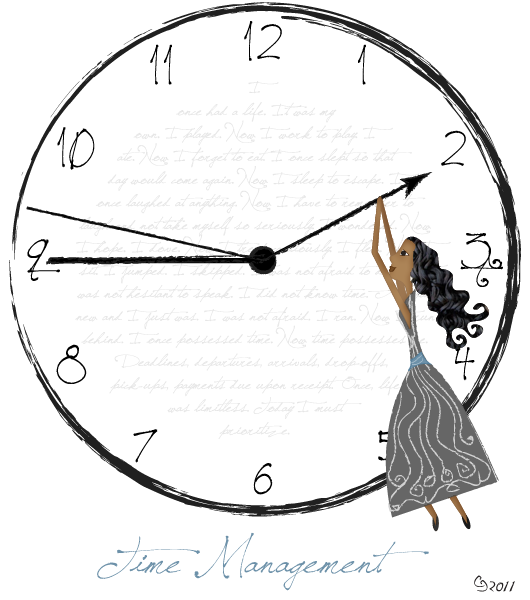 Assign time slots for accomplishing each task. Although it appears to be regimented, assigning time slots may actually make your time more flexible. You can even schedule 'flexible time' into your day to deal with fire drills and unexpected interruptions. In other words plan for interference with your schedule, deal with it and then go back to your schedule. 5. Focus on the difficult projects first. You can devote your best energy to accomplishing the least desirable or most challenging tasks and look forward to the less trying ones. 6. "Will it hurt me to throw this away?" If you don't absolutely have to file something - don't. Recycle, consolidate, digitize - SIMPLIFY. Don't create yet another time thief in your life. Don't create piles and files, only to have to devote time to going through them later just to clean up your office and declutter your mind. Do it now. This is really helpful. Now that the kids are back in school, I'm doing much better to stay on schedule because I know that if they need the structure. The main thing I'm not improving on right now is making time for exercise. Typically, when I have free time I opt to read or write. I know I need to make it a priority to get more physical activity in, but so far have not been motivated to do so. I hear you GG. I bike with lil' one to school every morning and afternoon, so I've forgiven myself a bit for not doing my yoga as much. However, like you, now that she's back in school, I'm working on transitioning to my 6:30am schedule for that lovely quiet time I enjoy.